At the heart of my music is a desire to communicate that sense of inner peace, wonder and joy that spontaneously arises when you’re in nature, meditating or contemplating a profound work of art. Composing music for the Centennial Park labyrinth helped me fulfill this aim. Like the spiraling, meandering path of a labyrinth, the journey in creating this piece was not straightforward. The seed idea for the music came to me before I even knew of plans to build a labyrinth in Centennial Park. I travelled north to soak in the sights and sounds of the Daintree rainforest and stayed in an unusual tree-house styled cabin in Cow Bay (just north of the Daintree river). 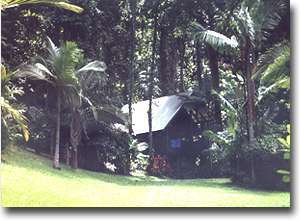 This cabin was an elevated timber cottage with a large deck, a rainforest botanical garden and no panes of glass in the windows. Cassowaries walked by the property in the morning and each day we were serenaded by Whompoo pigeons and Emerald doves. About four days into our stay in the Daintree rainforest, I began to feel especially alert to the new sounds of this environment and I had a vision of a piece of music. It was a piece of tremendous simplicity – chordal – with strings that floated against a backdrop of rainforest sounds. I wanted to capture a feeling of stasis (or time standing still) and deep inner transformation. Returning to Sydney, I sketched an initial idea – a sequence of floating timeless chords punctuated by long pauses in which birdcalls could come to the fore. 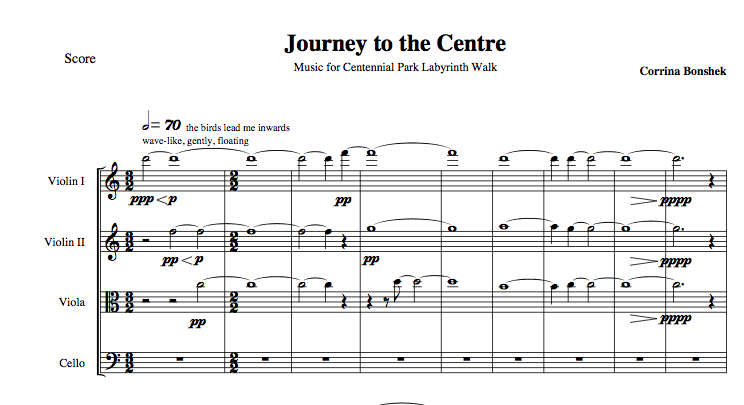 When I heard of the plan to build a labyrinth in Centennial Park, I immediately felt a calling to develop this initial musical sketch for the labyrinth. As a path for walking meditation, a labyrinth is a place to quieten the mind and open the heart. I felt like my music could lend a hand in helping people to have such an experience. As a Sydneysider myself at that time, I was only too aware of the busy-ness of daily life. Contributing this music felt like a great way of giving back to my community and also a way to encourage/enliven the experience of inner stillness in people’s lives. Interestingly, in composing for the labyrinth, I stayed truer to my initial vision than I would have done otherwise. At times, I was tempted to layer more complex melodies in the music to add contrast and excitement. But walking the labyrinth while listening to my drafts, kept me true to my vision of simplicity and profundity. Emily Simpson, the visionary who championed this labyrinth, was a valued sounding board. Upon listening to one early draft, Emily talked about the importance of the music building towards the centre and having a sense of arrival. She described the centre of the labyrinth as a space of ‘receiving’, where you can suddenly drop into a state of stillness or inner calm. 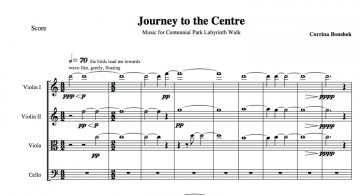 The idea of building the momentum of the piece towards a still centre really resonated with me and helped crystallise the structure of the piece – which musically expresses this journey to the centre of the labyrinth. Although musically this piece remains essentially chordal throughout, there is a sense of yearning and anticipation as the piece progresses. Heartfelt melodies begin to appear out of voiceleading. Anticipation begins to build both harmonically and through the use of cello ostinato – a repeating phrase and a tried and true technique for creating the expectation of continued motion. This ostinato helps set the stage for the stillness of the centre – which is musically marked as a complete pause of the chordal sustained strings and a thwarting of the ostinato. All you can hear is birdsong and a soft lingering pizz in the cello that is almost like a heart beat. Birdcalls are intrinsic to the piece. I was lucky to be able to include the remarkable recordings of Marc Anderson of Wild Ambience. Marc has recorded birds from all over Australia, Nepal, Malaysia and beyond. I especially wanted to feature the yellow oriole, a rainforest bird, at the beginning and end of the work, as a private emblem for the stillness and peace I felt in the Daintree. The majority of birdcalls were recorded in Kings Plains National Park NSW, with a Grey Butcher bird and Kookaburra taking centre stage. These birds are common throughout Australia and also inhabit Centennial Parklands. Birdsounds are part of our connection to a place. They help us feel at home and at ease. I hope that they help you feel invited and inspired to walk the labyrinth while listening to this music. Receive lovely emails about my birdsong inspired music. to my newsletter and receive exclusive music freebies.